Yet another diversion from the usual topics that appear here. These are the remnants (and my favorites) of a brief flurry of activity some years ago in the area of antique spring-driven phonographs. They make a nice decoration for the office foyer, in my opinion. All are fully functional and I have a large selection of the required cylinders and Diamond Disc records. The three models here are representative of the three styles that interest me so I have no plans to accumulate any more. The left-most unit is the Edison Standard, produced from 1898 to 1913 (the end of open horn player production). It was popular in the day and many exist. It played 2 minute long wax cylinders. There were conversion kits available to convert it to later 4 minute wax cylinders, or to make the unit speed-selectable. The middle unit is an Amberola 30. It played 4 minute cylinders made from a phenolic compound, much more durable and stable than the previous wax cylinders. These models also incorporated an internal horn for sound reproduction and thus had a neater appearance. The Amberola machines and cylinders were produced from 1911 through 1925 or so. The Amberola 30 was introduced in 1915. The model number reflected its $30 price. A better model, the Amberola 50, was offered at (you guessed it) $50. The rightmost unit is a C19 Chippendale machine from 1919. The Diamond Disc series overlapped the Amberolas but were more expensive and capable of superior sound reproduction compared to the cylinder machines. The C19 was an updated version of the previous C-250 (the “250” representing the retail price of $250). It had the same mechanical components but the lower part of the cabinet contained a record rack. This is the only one here of which I know the provenance. It belonged to my grandfather when it was new, then to my father. 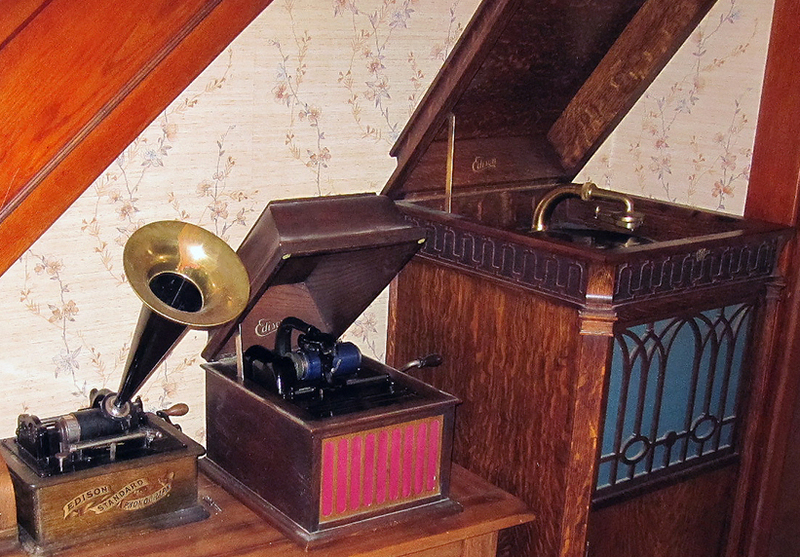 The Diamond disc series is very different from competing phonographs such as the Victrolas. Edison was aggressive about obtaining and enforcing patents on products like this, so when others wanted to produce phonographs they had to invent an entirely different method of recording and reproducing the sound. Edison’s machines recovered audio recorded at the base of the groove, making the stylus move up and down to follow it. That was protected by patent. Victrola thus had to incorporate a scheme in which the sound was recorded in the sides of the groove, so the stylus wiggled back and forth. The sideways “wiggle” method was never protected effectively so everyone but Edison used it. Probably because of that, it was the system that survived and is used today. Stereo records use both methods, one for each channel. You can tell at a glance which system a vintage phonograph uses by looking at the housing on the end of the tone arm. If the housing containing the diaphragm is horizontal (as in the photo above), it is a Diamond Disc player. If the diaphragm is in the vertical plane, it is the other scheme. As the name implies, the DD machines used a lifetime diamond stylus. This was possible because the stylus was driven across the record by a gear drive rather than being dragged across the record by the spiral grooves The other players all relied on the groove to drag the tone arm across and thus needed to use soft needles to reduce record wear. Their styli would last for tens (but not hundreds) of plays. You can tell the records apart because the DD records are nearly 1/2″ thick. The Victrolas and counterparts used platters the same thickness as “modern” records. Still no images since September, but everything is set up for an imaging session the next clear weekend. I have switched from the QSI683WSG-8 to an astro-modified Canon 450D DSLR. It’s been more than ten years since I shot with a DSLR so I don’t quite know what to expect. 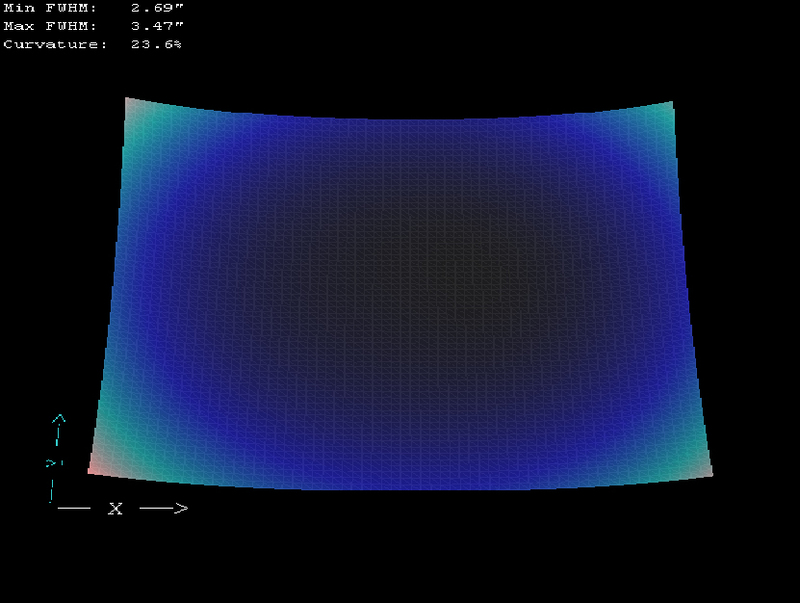 I know I’m losing the low noise of a cooled camera, and the sensitivity of unfiltered luminance frames. This camera gets rid of the amp glow that plagued my original (300D) camera so that will help. Made the trip to NEAF in Suffern, NY last weekend and had the usual great time. 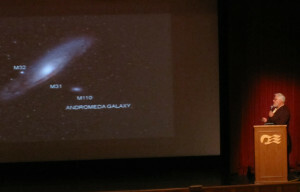 I enjoyed speaking to the usual folks and seeing the usual astro goodies. As in recent years, I failed to take photographs so I won’t be reporting on the show beyond that. I have found something new to do on the cloudy and/or windy nights. I’m just getting set up for making homebrew beer. Got a couple of kegerators (keg refrigerators), along with some 5 gallon kegs. Also a boiling pot, fermentation buckets, and all the fiddly bits needed to make stuff to go into the kegs. I even made the trip to the next county (the nearest homebrew store) and picked up fresh ingredients for my first 5 gallon batch. The trip next week is on the MSC Divina, which was just launched last year and which has been working in the Mediterranean. It is currently crossing the Atlantic for the first time. It is to arrive at Port Miami on the 20th and a short jaunt is scheduled (three nights) to a private beach and Port Canaveral, then back to Miami. That trip is intended to expose US travel agents to the ship, as it will be sailing the Caribbean for the Winter season. It then sails from Miami for a typical seven night Eastern Caribbean itinerary. I had originally booked for both trips back to back, making a ten day trip out of it. Then MSC decided they didn’t need a lecturer for the three night jaunt so they cut me back to the seven night leg. OK; no big deal. Friday they changed their mind and called to see if I could join on the 20th. Well, I’m flexible but not THAT flexible; I had already firmed up my travel plans. Again, no big deal. If I had been in a position to accept that assignment I’d have been glad to be offered it. My last lecture trip was a longer one; from Buenos Ares to Valparaiso via Cape Horn. As we were sailing back up the Western coast of Chile the earthquake struck. It had no effect on the ship; the waves created were, as always, very small in the open ocean. It is when they reach shore that damage happens. It turned out that the port facilities at Valparaiso had been damaged by earthquake-related waves and when we arrived we had to wait at anchor for a few days before disembarking. That would have goofed up my return flight – but the airport at Santiago had been damaged by the earthquake so we were stranded there for a few more days anyway. No big deal; trip insurance reimbursed me for the extra expenses. No use being upset at the delay; the effect on me was trivial compared to the victims of the event. The only other time I had an extended delay in returning home was caused by the 9-11 attack. We were sailing along the Alaskan coast when that happened. When the trip ended at Vancouver we couldn’t get home because US airports were closed. No hotel expenses that time, Celebrity put us up on a ship while we waited. Again, there was no important impact on me; it was the attack victims who suffered. I generally travel in Winter so I’ve had to wait in Florida or California due to canceled Ohio flights a few times but again, an extra day is no big deal and travel insurance covers a hotel night. It’s just a matter of not being so self-involved as to consider an unexpected schedule change to be a personal disaster. All of the above impacted the revenue passengers just as much as it did me, so it wasn’t really a result of the lecture gig; it’s just that cruising more frequently creates more exposure to such events. Flexibility specific to the job is required, though. For one thing, some cruise lines (Princess is one) don’t guarantee what class of cabin you will be assigned. Sometimes it is a junior officer’s cabin, which is cramped if you brought a guest (you always have the option of bringing a guest). You never know your full schedule ahead of time; the daily ship’s newsletter arrives each night and you have to look to see when, where, and if you are scheduled for the next day. It might be in a lounge, or in the movie theater/videoconference room, or in the main showroom. Generally you will be expected to present one 45 minute session on each “sea day” (a day on which the ship doesn’t stop anywhere). That usually works out to two or three sessions on a seven night trip and three or four sessions on a ten night trip. Ocean crossings, of course, have a LOT of sea days so you’ll need more material for those. 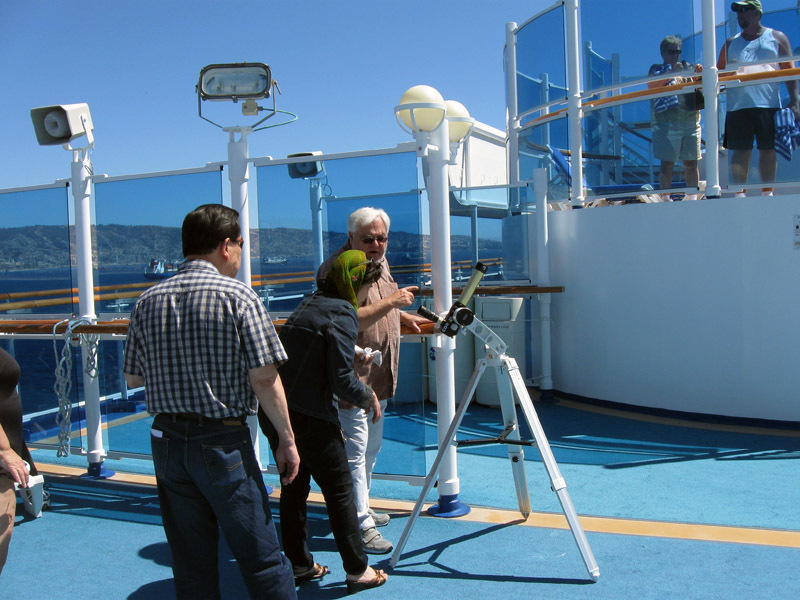 If your topic is astronomy you’ll probably be asked for additional duty in the form of one or two stargazing sessions on deck. Binoculars and a GLP are usually sufficient, though I generally have a small refractor and an alt/az mount along. Although the ships cruise at 25 knots or so, they are stable in calm weather and so long as the magnification is kept reasonable the views are OK. Expect wind (I did say the ship will be cruising at 25 knots!). 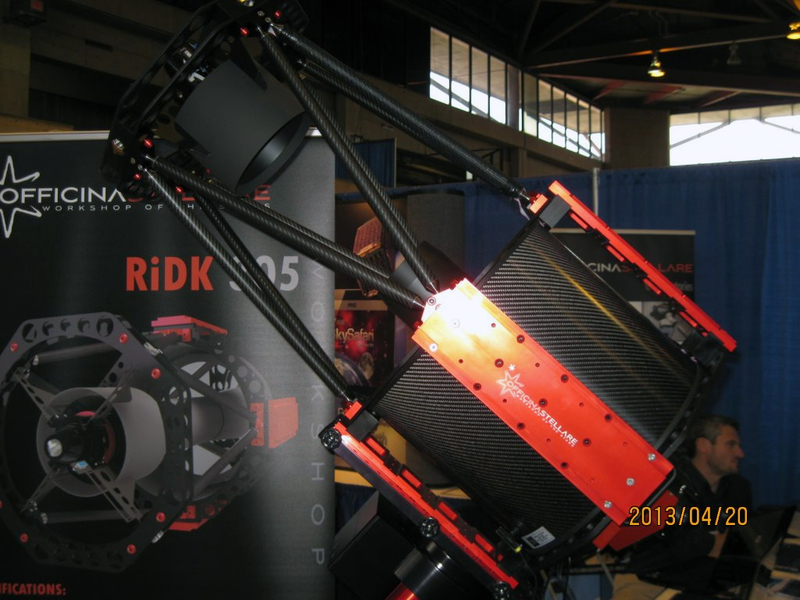 On the South America trip I brought along a PST and offered narrowband Solar views that folks seemed to enjoy. The photo on the previous post shows this activity while we were anchored off Valparaiso waiting for port facilities to be available for disembarkation. I’ll have the PST along on this trip, too. The rest of the time you are just another passenger with full privileges. Some discounts are usually offered; maybe a bar discount or discounted shore excursions. Sometimes they will comp the tips (about $10 per day total is expected on most cruise ships). The second thing you need to know is that although there are LOTS of cruise ships, there are also lots of folks who provide this service. You aren’t going to be paid unless you have celebrity status. You’ll probably have to pay your own travel costs to and from the port, too (folks who live in port cities have a big advantage here). You’ll pay a modest booking fee to the agency who sets it up. In exchange for these plus a few hours of duty, you and a guest will receive a complimentary cruise with full passenger status and probably some discounts. If you are on Princess, make sure the guest is someone with whom you are willing to share a bed in case you don’t get a passenger cabin! On most other lines you can count on a standard passenger cabin with two beds available (even if you don’t bring a guest). If you have interesting knowledge to share (and astronomy is fairly popular as an enrichment topic), can present the information clearly but in an entertaining manner, and are willing to invest the necessary effort in preparing your materials (most lines will insist on PowerPoint visual aids – and your own laptop to play them) you might consider signing up with one of the agencies to whom the cruise lines go for such postings. I use ToSeaWithZ http://www.toseawithz.com/ and have been very satisfied with them. I enjoy the presentations – in fact, when I cruise as a “normal” passenger I kind of miss them. I know it’s been since the end of August that I made it out to the observatory. I figured I had better post something to explain that there are no equipment problems. It’s just a matter of time and weather. I won’t be out there this month, either, but I plan to be more active in December and in the coming year. I’ll be busy for the next week getting ready for an outreach trip that will use up the rest of the month. I will be aboard the MSC Divina for a week’s duty as guest astronomy lecturer. It’s been a couple of years since I last did this so I’m looking forward to it. It will be my first gig with MSC (though I’ve been on their Poesia as a passenger). I’ve worked previously with Norwegian and many times with Princess. It lets me combine two favorite activities – and it gives me an excuse to cruise more frequently than my usual once per year. For a very weak link to this site’s usual topic, I’ll be bringing along a Meade/Coronado PST so I can expose the passengers to some narrowband solar observing. I took one on the last trip and folks seemed to enjoy it. I mentioned previously that I had switched over temporarily to a borrowed 12″ F/8 LX850 OTA. I didn’t mention that it was a prototype incorporating a proposed new feature – installation of a forced-air setup comparable to previous 7″ and 16″ LX200 models. I’ve been using it and trying to get a feel for how effective the cooling is compared to the three 12″ F/10 Meades I owned previously, though of course without a controlled, side by side A-B test the result won’t be definitive. The fan has been running during all of my imaging runs, to take advantage of whatever improvement there is. I conclude from this that fan vibration is having no effect on star images. Let me preface this post with a warning not to read too much into the above images. 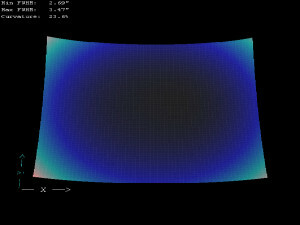 They are indicative of a software estimation of the effects of field curvature under the conditions at the time of the test images, using the particular camera and OTA. They are most useful for comparing different instruments if the test images contain similar distributions of stars and if the camera chip sizes are similar, not for deriving an actual measurement of anything. In this case, the OTA is a Meade 12″ LX850 tube, the camera is an QSI683WSG-8, the starfield is centered around Albireo, and seeing was mediocre (see the FWHM measurements). The charts were generated from calibrated but unprocessed FITS images by CCDWare’s CCDInspector. BTW, I strongly recommend CCDI; I don’t shoot without it. It lets you know just how everything is working. There’s still a bit of focuser tilt (in MY focuser, not Meade’s!) but it’s not bad enough to affect what the charts are trying to show. I have old images from a conventional F/10 Meade SCT somewhere around here (they’d be ten years old by now). I was using a camera with a fairly similar chip size – and if I want to I can crop them from APS size to 8300 size to make then the same. Some should contain appropriate starfields (the results are distorted if a bright DSO or too many bright stars are in the field). When I find them I’ll post the same analyses for comparison. Bottom line? The ACF (and especially the F/8 ACF) tubes are said to be flatter than the conventional F/10 SCT of the same aperture – but they obviously aren’t FLAT flat. That’s fine if the end result is curvature you can live with – or if you have a suitable external flattener. I might have something suitable here. The next step is to take similar images using a couple of flatteners I have lying around and see how they do. It’s a matter of design priorities. 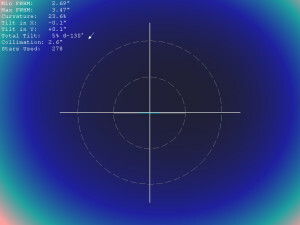 The Edge HD starts with a conventional SCT (spherical mirrors plus a Schmidt corrector) and then adds even more refractive optics to correct for coma and to flatten the field. Neither is (or can be) perfectly effective – but the results are a very large improvement and folks like them. Meade’s approach was to accept the necessity of the Schmidt corrector, but not to add any more correctors inside. They instead selected mirror curves that don’t generate coma in the first place; more of a purist attitude. I’m just barely willing to accept the Schmidt corrector (my preference is really for a pure Cass reflector like the RC, though the more I shoot through this thing the more I like it) and prefer a design that doesn’t pile on more elements. If I need a flattener I can add one of my choice – and if I don’t need one I can skip the extra stuff entirely. What I don’t know yet is whether it is really flatter than a conventional SCT or if just seems to be because the lack of coma makes the corners look better anyway – and if so, how is that achieved? I intend to find out. Watch for updates on this subject. No skies so a little gear maintenance. The very best thing about borrowing the SCT was that it caused me to discover a problem I’ve experienced ever since upgrading to the 12″ RC from the 10″ version. I transferred my trusty old Moonlight focuser to complete the swap. I’ve had that focuser on any number of SCT and RC telescopes with great performance. I noticed right away that I had poor star shapes with the new RC, which I had purchased as a “scratch and dent” special due to a serious hit in transit to a trade show. I was sure it was a primary centering issue caused by the hit so I was looking forward to swapping a different OTA onto the mount so I could tear down the RC and sort that. 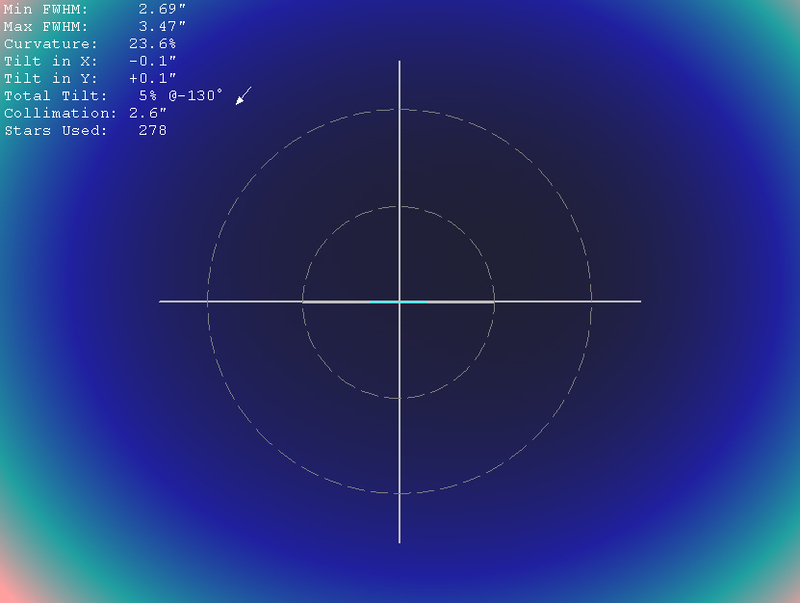 Didn’t even think about focuser alignment because I had just been using it without issues. WELL – there still might be a centering issue but I suspect not. When I transferred the focuser onto this SCT I discovered the same kind of centering/tilt symptoms! Turns out that when I transferred the focuser onto the 12″ RC it became misaligned (it had been perfect on the 10″). I don’t remember dropping it or anything, and collimation adjustments on the Moonlight are nice and beefy – but it happened somehow. I put the camera directly onto the telescope and all was well so that nailed it as a focuser issue. The internal focuser works very well, indeed, but I need remote focus to follow temperature changes so I stuck my old Meade Microfocuser on there and that worked fine also. I miss the stepper-driven Moonlight, though. Tonight I put it on the bench and found it to be way off. I adjusted it and got it very close. I may have to tune it up a little on a telescope but I’m in the neighborhood. I’ll stick it back on the LX850 OTA next time I’m out there and see what I see. Then, when I put the RC back in I’ll see how that does with a well-collimated focuser. I’ll bet it works properly for the first time ever. It’s embarrassing to report such a misdiagnosis, especially when I’ve owned the 12″ for a couple of years and had plenty of opportunities to catch it! Still, a happy ending is a happy ending and there’s a good chance that this was the only issue with the RC. I had an opportunity to borrow a 12″ LX850 OTA so I snatched it. I’ve previously owned three 12″ F/10 Schmidt-Cassegrains and reviewed a 12″ RCX back in the day – and my current primary instrument is a 12″ F/8 RC so I have a pretty good idea what to expect. I haven’t done any serious analysis yet but I’ve had it on the mount for a few sessions and can make some comments. All my leftover accessories from the old F/10 scopes fit the new model. I was going to re-use my tube rings but after taking a look at the beefy radius blocks on the new OTA I decided to stick with the supplied dovetail plate. It’s very strong and I trust it to remain rigid more than I trusted the original Losmandy plates on my old tubes (hence the tube rings). Plus the new plate has adjustments to eliminate cone error! I haven’t bothered with that but if I owned one of these and planned to use it long term I would. The metal dewshield dropped right on, though of course it’s the old shiny finish. Speaking of finish – that pebbly new finish grows on one after a while. I didn’t think I’d like it. I even found the old 3.25″ Meade flange for my Moonlight focuser so I was able transfer that to the new Meade tube. About the focuser: This is as good as I hoped it would be when I first heard about the new design. Firm, smooth, no backlash and little or no image shift. I haven’t noticed any but will watch it with a camera when time permits so I can make a definitive statement. I wouldn’t have bothered with the Moonlight but I rely on being able to focus remotely. I believe that with one of the old belt-drive Robofocus motors this focuser could be controlled just as accurately as my stepper-equipped Moonlight. I checked image scale with the Moonlight in place, by the way, and was a little surprised at the modest focal length increase. It’s running at 2530mm (F/8.3); I’m used to seeing a larger increase from adding a focuser to an SCT. Makes sense after some thought, though. The F/8 tube uses a secondary with a smaller multiplier. The good news is that this probably also means less focus shift with temperature, but of course that isn’t eliminated (thus my need for remote focus capability). This OTA is probably about as close to what the RCX could have been as anything we are likely to see. It has the same great optics set and solves the traditional focuser issues, though in a different way. The RCX did have some other nice features. I won’t miss the internal dew heater much; that’s easy enough to do otherwise. The remote collimation was very cool, but my gear isn’t moved around so I don’t need to collimate frequently. I did really, really like the through-the-tube airflow with rear fans and front vents; that is a great way to end tube currents. I think that when this one goes back home I’ll miss it as much as I missed the RCX. There are several extremely active threads running on CN about the LX850 and about Meade’s future and all of the mistakes that drove Meade to the edge. One frequently-reported mistake is that Meade didn’t offer the kind of telescope the poster wants, as though the poster’s preferences alone drive the market. In many cases, the product Meade “failed to deliver” was actually a good seller for a decade or more; in others, it was tried and no market was found. Either way, it appears that the poster is just unfamiliar with Meade’s product history and is merely making stuff up to complain about. The truth is that Meade made real mistakes, most notably the premature RCX400 and LX800 releases – but those are old news. They contributed to Meade’s current problems, but they aren’t relevant to discussions of the current product line. In the active threads, one might wish that the majority of posts were from folks with experience with the new products – but this is not the case. Most of the posts come from a few people who haven’t used the gear but just can’t stop repeating their rants and who apparently don’t read posts from folks with more knowledge of the products. Between the attacks and the fact that posts apparently aren’t read anyway there has been a chilling effect; those with the greatest knowledge of the relevant products are posting less and less. I certainly don’t feel like entering the fray until I have something specific to report or a new image to share. The funniest bit is that one of the most active of the Meade bashers is actually a dealer for several mount manufacturers who compete with Meade! This kind of thing is one of the primary reasons for the restriction in CN’s Terms of Service, which forbid a vendor from “commenting, directly or indirectly, on competing products”. I believe that he has simply worn the moderators down by posting all day, every day (no other vendor does this on CN). If the mods tried to enforce the rules on this guy, they’d have to quit their day jobs. I did see my name mentioned today; someone commented that I seemed to be pleased with my LX850, but that it wasn’t outperforming my previous mount. If one doesn’t know what that mount was, it might seem like a disappointing result. As my previous mount was a Takahashi NJP, that would be a misunderstanding. I’m certain that Meade never hoped that the LX850 would outperform an NJP – but in one sense it actually does! Out of the box, it does a better job than the NJP did out of the box. The NJP required additional guiding hardware (OAG, guide camera) at the focal length I’m using. If I thought I could easily find that post again out of the pages and pages of noise, I’d probably step in to clarify that.